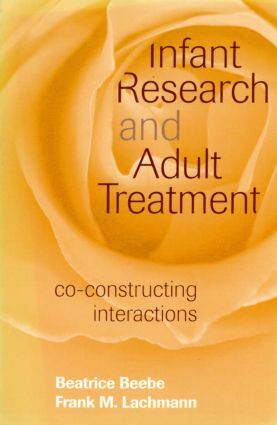 Infant Research and Adult Treatment is the first synoptic rendering of Beatrice Beebe’s and Frank Lachmann’s impressive body of work. Therapists unfamiliar with current research findings will find here a comprehensive and up-to-date overview of infant competencies. These competencies give rise to presymbolic representations that are best understood from the standpoint of a systems view of interaction. It is through this conceptual window that the underpinnings of the psychoanalytic situation, especially the ways in which both patient and therapist find and use strategies for preserving and transforming self-organization in a dialogic context, emerge with new clarity. They not only show how their understanding of treatment has evolved, but illustrate this process through detailed descriptions of clinical work with long-term patients. Throughout, they demonstrate how participation in the dyadic interaction reorganizes intrapsychic and relational processes in analyst and patient alike, and in ways both consonant with, and different from, what is observed in adult-infant interactions. Of special note is their creative formulation of the principles of ongoing regulation; disruption and repair; and heightened affective moments. These principles, which describe crucial facets of the basic patterning of self-organization and its transformation in early life, provide clinical leverage for initiating and sustaining a therapeutic process with difficult to reach patients. This book provides a bridge from the phenomenology of self psychological, relational, and intersubjective approaches to a systems theoretical understanding that is consistent with recent developments in psychoanalytic therapy and amenable to further clinical investigation. Both as reference work and teaching tool, as research-grounded theorizing and clinically relevant synthesis, Infant Research and Adult Treatment is destined to be a permanent addition to every thoughtful clinician's bookshelf. Beatrice Beebe, Ph.D., a psychoanalyst and infant researcher, is Associate Clinical Professor of Psychology in Psychiatry, New York State Psychiatric Institute, Columbia University, where she has been doing infancy research for 30 years, first with Daniel Stern, M.D., and then with Joseph Jaffe, M.D. She teaches at the Columbia University Center for Psychoanalytic Training and Research, the Institute for the Psychoanalytic Study of Subjectivity, and the New York University Postdoctoral Program in Psychotherapy and Psychoanalysis. Frank M. Lachmann, Ph.D., is a founding faculty member of the Institute for the Psychoanalytic Study of Subjectivity, Training and Supervising Analyst, Postgraduate Center for Mental Health, and Clinical Assistant Professor at the NYU Postdoctoral Program in Psychotherapy and Psychoanalysis. He has contributed over 100 articles to the journal literature, and is author of Transforming Aggression (Aronson, 2000), and co-author of Self and Motivational Systems (TAP, 1992), The Clinical Exchange (TAP, 1996), and Infant Research and Adult Treatment (TAP, 2002).